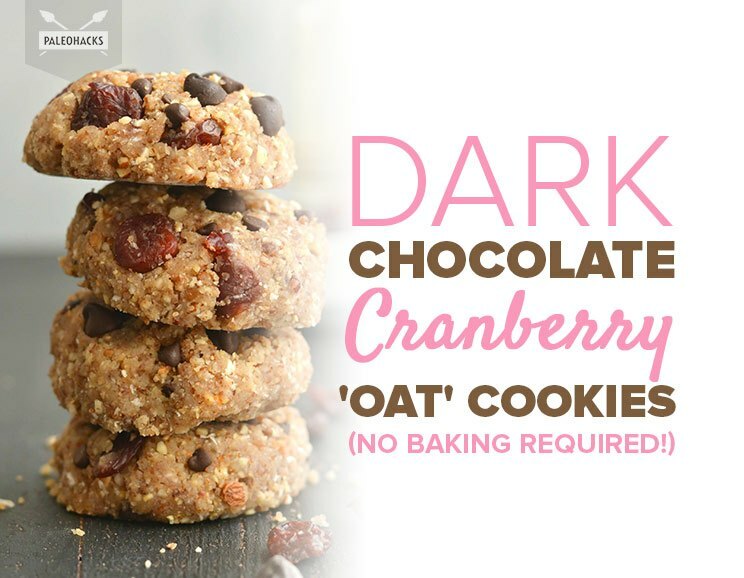 Made from cranberries, hazelnuts, pecans, and almonds, these oat-less cookies are bursting with a blend of nutty-sweet flavors. 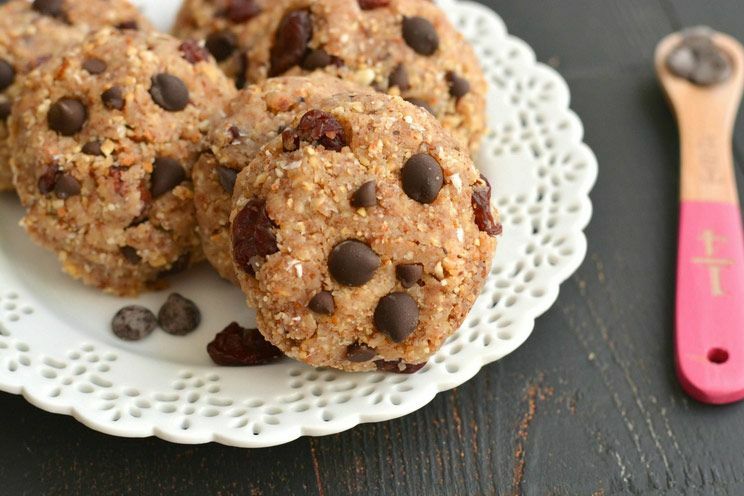 Compared to traditional oat cookies, this recipe is completely no-bake and easy to whip up. All you need is a reliable high-speed blender (or food processor) to get started. The key ingredient in this recipe is the hidden coconut butter that helps hold the cookies together. It provides a soft silky texture that creates a chewy base and is perfect for adding in a dose of healthy fats. Tip: Make your own homemade coconut butterusing this simple two-ingredient recipe (It’s the best!). Dates are mixed in for a touch of natural sweetness. Its high-fiber nutrients help improve your digestion and serves as a nutritious glue for holding the cookies together. Best of all, it blends in perfectly with dark chocolate chips, cranberries, and nuts. To make the cookie batter, start by pulsing the nuts, dates, and shredded coconut until it becomes a crumb-like “oat” texture. Be sure not to over-process or its natural oils will turn into a nut butter! Next, add the coconut butter and coconut oil to the batter. Blend on high until fully incorporated. Then, transfer to a large mixing bowl and stir in the dried cranberries. Make sure to use unsweetened cranberries since the dates already add plenty of natural sweetness. Scoop the batter out with a measuring cup (about ¼ – ⅓ cup for each) and use your hands to form the batter into round cookies. Don’t worry if the dough is crumbly, it will hold together after it sets. Place each one on a baking sheet and add the chocolate chips on top. 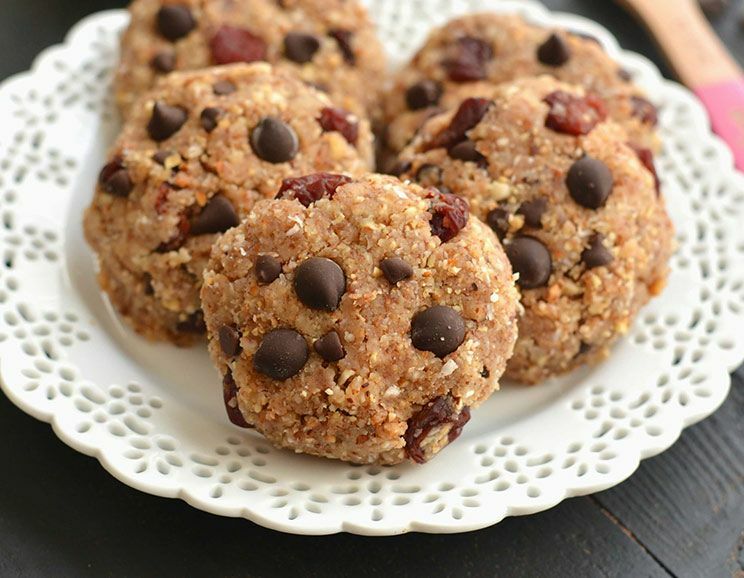 Place the cookies in the freezer for 30 minutes and enjoy immediately after as a healthy snack! Keep your cookies in the refrigerator up to one week or in the freezer for up to three months. Place the dates, hazelnuts, almonds, pecans, shredded coconut, and salt into a blender. Pulse until you get a crumb-like texture. Add the coconut oil and coconut butter to the blender and pulse until combined. Transfer the mixture to a large mixing bowl and fold the dried cranberries into the bowl with a spatula. Roll the batter into 12 cookies (about ¼ – ⅓ cup of the batter makes one cookie) and place onto a baking sheet lined with parchment paper. Gently push the chocolate chips on top of each cookie. Transfer to the freezer to set for 30 minutes and then remove and enjoy!